So this was a high-volume shopping and totally bad at minimalism month, though many of my purchases were secondhand, at least. I started window shopping over July Fourth weekend and suddenly found that I'd ordered a completely ridiculous quantity, including an APC half-moon bag (discounted to $380 USD at Ssense, but now sold out). Then I sent most of it back because very little of it worked. Womp womp. The half-moon bag was a bit too big for my height and build, and too stiff for my tastes. My battered and much-beloved Coach City fills the same niche more comfortably (used at Etsy here and here, or more affordably on Ebay including here). 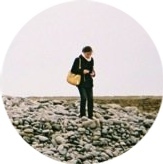 Other things, like a Madewell Central shirt, just didn't flatter on me. I still ended up keeping quite a few things, mostly unseasonal items. This month was my first time shopping at ThredUp. I had a good experience, with their reasonable prices and a 40% off your first order discount. I did make a few mistakes, but those are on me. It's expected that their return policy wouldn't be as forgiving as a retail store's (returns within 14 days to original method of purchase). I, er, misinterpreted their policy initially, and assumed all returns were store credit only, so I ended up keeping (and paying for) a few sweaters I wasn't sure about and haven't listed. Those will be gifted to my younger sister, W, as they'll suit her much better! As for my yearly budget for 2017 ($150 x 12 = $1800), it's not looking fantastic in terms of my staying under, though I technically made a tiny bit of progress this month. I'm now $162.98 over budget for the year, rather than last month's $168.18 (($150 x 7) - $555.98 - $154.21 - $94.79 - $35.93 - $128.80 - $98.47 - $144.80 = $162.98). I buried this detail in another post last week, but I may be taking a new job that will change some of my work wardrobe needs, and could result in not getting back on track for this year's original clothing budget. It's very exciting, and I'm so happy with it, but I definitely couldn't have predicted it! Uniqlo Womens Volume Skirt - $29.90 - I've been wanting a navy blue midi skirt (inspired by Adina!) for more than a year, but was never able to find one I wanted to try on. I ended up experimenting with a striped J.Crew Factory skirt (similar in limited sizes here and here) last year, but that was pretty far from the design I had in mind. 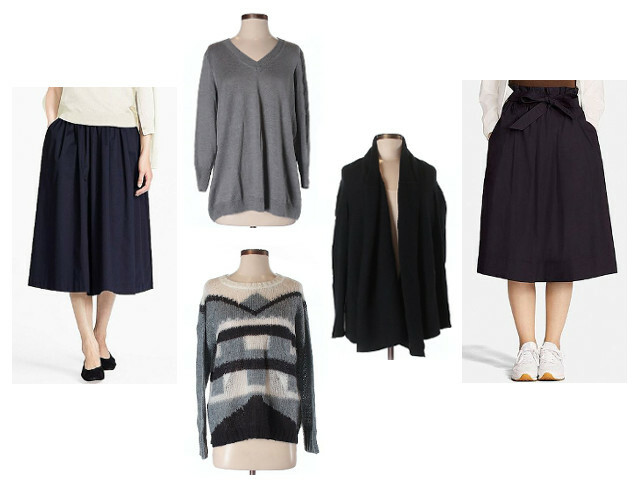 This year, Uniqlo had two skirts that were close, this one almost exactly. These skirts are actually not super-practical for me. They're cotton-poly blends, and not terribly comfortable in high summer heat and humidity, because of the volume of fabric. They go a little past mid-calf on me (maybe an inch past how it looks on the models.) Both have very elastic waists, to the point where I'm not sure exact sizing... matters terribly much, there's so much fabric, and the waist so stretchy. I picked a size M in both. Wearing these to work is outside my comfort zone, so it remains to be seen how much actual use I get out of these. Uniqlo Women High-Waist Belted Flare Midi Skirt - $29.90 - I like the belted waist design here, though this design is less like the simpler look I had in mind for a midi skirt. I originally intended to keep only one, because I definitely don't need two midi skirts that I'm generally not inclined to wear to work, but I ended up not being able to pick. This was a bad-at-minimalism month for sure. Even with the downsides of these, I just find them really fun to twirl around in, even if only indoors, and I couldn't resist. Club Monaco Open Cashmere Cardigan - This drapey open cardigan is essentially identical to an item that's still in stock at Club Monaco, which I've linked. It seems to be a design they redo frequently. I got this in M/L, which has a very generously sized shawl collar that is nice and cozy, but is otherwise not too oversized on me. J.Crew Linen Sweater - Not sure how old this is, but it's 100% linen and very boxy. I love this, despite the dull color and boxy-ness. It feels like a very Eileen Fisher-like look when I wear it with my Grana silk ankle pants (use my referral link for 10% off your first order, and I'll get $20 store credit if you make a purchase, thank you for your support!). I can't find anything similar in linen at J.Crew or other mall stores, though this Loft sweater in cotton-nylon blend has a very similar look and feel in brighter colors and this Lou and Grey all-cotton sweater is similar in spirit and color, but much slouchier. Madewell Patterned Sweater - I think Madewell does a sweater like this almost every year in recent memory. I have a slouchy patterned sweater from H&M and before I started monthly budget posts that's a favorite, though one that's not held up terribly well to regular wash and wear. Thus, I'm generally partial to wearing a loose-fit patterned sweater (that requires a black camisole underneath, I like these from H&M and they last for years) over dark skinny jeans in winter. Have you shopped at ThredUp before? Were you able to find any gems? Wear to Work: "Appropriate Attire"
Recently, there was controversy about the women's dress code at the House of Representatives. Specifically, multiple women journalists had been barred from parts of the building for wearing sleeveless dresses. Apparently, the text of the rule left some room for interpretation, providing for "traditional coat and tie" for men, while providing only for "appropriate attire" for women. 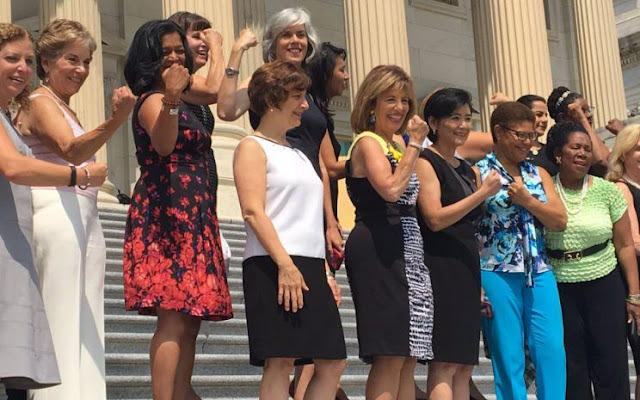 After several congresswomen spoke up about what was, in their view, an archaic interpretation of "appropriate attire" or "appropriate business attire" to exclude sleeveless business casual attire, change is promised. This is an interesting question for me, because, well, even as I loathe "full dress" business formal with all of my being, I nonetheless believe in its importance for certain occasions, particularly court and job interviews. My natural tendency is to push the business casual boundaries towards the casual as much as possible for any given workplace. Nonetheless, I'd still be shocked - shocked! - if I saw anyone appearing for an interview with me or before a court in "problem" attire (peep-toe shoes, loud colored shoes, etc.). Of course, congresswomen themselves are absolutely the most qualified and the most vested with the authority to make decisions about what is appropriate in their workplace! Furthermore, the expectations for journalists who happen to be conducting interviews or otherwise working in the building should absolutely not be the same as, say, for someone speaking on the House floor. If one is to draw an analogy to the courtroom, of course the attorney likely should be in a suit (they may not need to be, but a failure to don one, of the right general color and formality level could cause a jury or a judge to react poorly), but there's no such expectation for members of the jury, or for witnesses, or for people observing the proceedings, including journalists. Absolute formality in business clothing has its place, but a somewhat limited and specific place, only for people in certain roles. As for me, well, thanks to a recent job offer after a long, long interview season, I may be becoming part of that dramatically high attrition rate statistic (also see piece from 2006) for minority women in biglaw. I'm possibly destined never to be back after having worked in biglaw for a little less than a year before my clerkship. It's incredibly exciting, though not set in stone just yet! One side effect of the possible change will be a need to buy more suits and expand my collection of more formal work clothing. Back in biglaw I'd often have several days, perhaps even several weeks on end where I wouldn't expect to see or speak face-to-face with anyone but my officemate and other junior associates, but that's looking to change. More client contact and more court proceedings or important proceedings may be in my future. Moving is my least favorite chore, bar none. Now that I've done it three times, I have enough experience to offer a few tips on in-NYC moves. I've moved between buildings in Manhattan twice, and, a few weeks ago, I moved between two units in my building. Given how much things cost, how most NYC residents don't have cars and don't know anyone with one, etc. etc., general best practices for cost-conscious moving in the city are likely a little different than elsewhere. One note: moving is an area in which I'm a bad minimalist. Because of the realities of how expensive it is to move and store things here, it can offer be better to throw things out and replace them later than to keep them. While I'm not especially prone to frugality while moving (convenience and not needing to lift my furniture myself wins out every time, I've always used professional movers and tipped well), frugality always beats minimalism for me when moving. Back when I left student housing, I was at least able to give away much of what I wasn't keeping, which was nice for the recipients, the planet, and also for me because I didn't have to drag things out to the curb. Also, this helpful post is generally accurate for the details that I can corroborate and seems to be quite useful as another data point on this topic. With that, here are my tips for moving in NYC. 1. Just say no to the storage unit rental. This isn't a concern in all moves, but it was a possibility when I briefly moved out-of-state to study for the bar exam between graduation and starting work. Normally, a NYC-dweller would impose on the kindness of friends and store things in their apartments, but my friends were all doing similar moves, so that was out. K was working and able to store some things, but he lived in a studio furnished to near-capacity, and I didn't want to crowd him in his own place. I didn't want to keep much, just the objects pictured above and an Ikea Hemnes dresser and nightstand, but I worried the dresser wouldn't fit. As it turns out, even a small storage unit for three months cost more than the replacement cost of the dresser and nightstand, and that was before factoring in the money I'd inevitably need to spend transporting everything to and from the storage unit. Most frugal types agree that storage units are a giant waste of money. The dresser, nightstand, and everything else ended up fitting comfortably in K's studio, so that worked out. 2. Do what you can by yourself. This is regardless of whether one is hiring movers. Generally, moving fees correlate to how long a move will take, so if you've packed everything yourself, and disassembled overly bulky furniture, that will keep costs down. It's fine, in my experience, to keep bare-bones bedframes (like this) and most other furniture assembled, but fancier beds may need disassembling. K and I try to move ultra-fragile items that require special handling, i.e. the television, ourselves, often with the help of his parents and their car, so the movers can work more quickly. 3. Hire movers, probably, and comparison shop. For myself and my NYC-based friends, there's no way to avoid hiring professional movers. No one is comfortable with driving in the city, certainly not enough to drive a rented Uhaul. It's really far too big an imposition on our friends to have them spend hours on a weekend helping with a move anyway, and we would never ask. Movers are the way to go. Move 2: $430 before tip, fairly typical studio apartment move, two elevator buildings, total time 2.25 hours. I booked a month ahead. I'd have expected to pay maybe $360 for this move before tip if I had comparison shopped. Incidentally, the moving company proactively arranged for a partial refund because we ended up having fewer objects than we listed when we booked, which was a pleasant surprise. This move was originally $450. Move 3: $240 before tip, same-building one-bedroom apartment move, elevator building, total time 45 minutes. This was my first time booking a move without Unpakt. It's very possible that I'd have gotten a better rate if I shopped around more, for a company willing to forego a two-hour minimum (the $120/hour rate for movers is likely one of the lower rates out there), but I had been averse to looking more because the first company I called quoted me $700, making $240 feel like a steal. Also, I think it's fair to require paying for two hours, given that movers need to drive in to Manhattan with a truck so that they can bring dollies and moving blankets. Also, please do tip your movers well, as they're performing a difficult and important service. I strongly believe there's a moral obligation to tip well in this context. All of my tips have worked out to ~$30-35/person on the crew for fairly quick, small-ish, elevator-building moves. This seems a reasonable and somewhat generous rate (look at the most recent post from a few months ago, not the ones from five years ago). I would expect to tip more if I was moving to or from a walkup. 4. Ecletic storage solutions are often necessary, and may need to be replaced in the next apartment. I've been lucky enough that my apartment kitchens have always had reasonable cabinet and counter space until just now. My current apartment has an extremely illogical lack of cabinets, as you see above. Space may be extremely limited, so it's not unusual to need something like a kitchen cart with a wooden top to create counter space for food prep or a (somewhat unattractive) set of wire shelves to compensate for a lack of cabinets. Spices, dry goods, etc. may all end up out in the open. Illustrative examples of common storage solutions are below, though in actual practice, I think these things should be fairly easy to find on Craigslist and the like, as most any apartment presents unique challenges on the kitchen storage front. These items are also quite expensive at retail! As for K and I, we opted for the most frugal option we could find to solve our kitchen cabinet problem, using interlocking stackable wire shelves (different size online). We also got a sliding drawer mesh organizer for spices on our counter, but alas, we somewhat resent how much it cost. (Storage items are so pricey, and generally cheaply made.) These items were, at least, on the frugal end of what was available, and potentially versatile enough for future apartments. The same, in my experience, goes for legal work, particularly in litigation, and interactions with colleagues and opposing counsel. Justice Sonia Sotomayor's excellent memoir (one of the books that has made the strongest impact on me) doesn't say this as such. but it's strongly implied. In particular, she casts no stones about not getting a full-time offer from her summer firm, blaming only herself. Given how long it took the industry's doors to open to women (see, e.g., the section on the 1970s in this academic article and this piece on more recent trends), it's not a huge stretch to speculate that prejudices about race, gender, and the combination thereof may have played a role. These role models are people who treat every person, even those voicing views sharply in contrast with their own, with the utmost respect and civility. 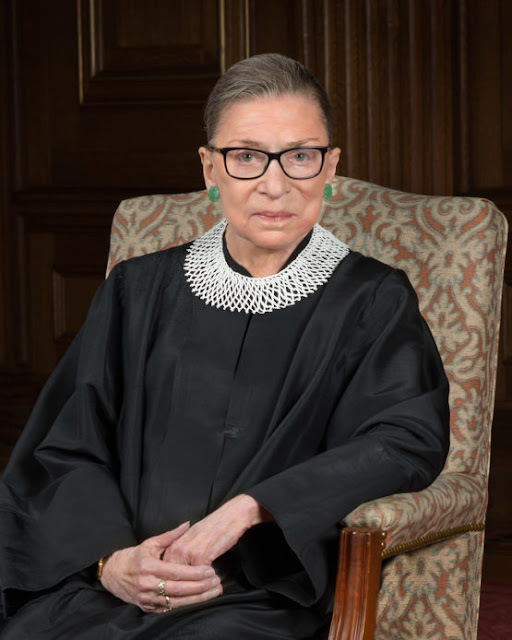 The most vivid and well-know example is probably the famously close friendship between Justice Ginsburg and the late Justice Antonin Scalia (his Romer v. Evans dissent may be instructive as to why this may be a shock, i.e. in paragraph two). They are people who rise above the slings and arrows directed their way in order to be the best attorney they can be. In Justice Ginsburg's case, she encountered particularly overt sexism, given the timeline of when she attended law school and began her career. You'll rarely hear her speak of it. I had to search hard for a readily accessible online citation for how things were: "Upon graduation from Columbia Law School with top honors in 1959, she received no job offer from any law firm in New York City, presumably because white shoe law firms were aghast that a woman, a mother and a Jew would dare think she was qualified for the job." She has also written that, back then, law firms simply "would engage no women" as a matter of absolute policy. There is a difficult balance to be struck between exhibiting the collegiality, civility, and grace that the best attorneys embody while still taking a stand for what is right. It has sometimes been so, so hard to rise above. It's entirely likely that, in the next few months or years, I'll sometimes write about some of the challenges in this profession that make it difficult to face down everything with the ideal amount of collegiality. But that's a story for another day. I'm now in year three of wearing my trusty, if not terribly attractive, Fitflop Skinny fit flops (worn in photos linked here) as my primary summer shoe. They've had a good run, accompanying me through many a summer thunderstorm and to a few beaches, but they're starting to show their wear, with worn-down heels and a slightly stretched-out uppers. They're still much more comfortable to walk and stand in than ballet flats or sandals with less arch support, but my feet and legs are starting to ache the way they do when I wear running shoes that are over the hill, and have had their inner cushioning worn down by excessive wear. In short, it either is almost time or is already time for a new pair of summer shoes. I've had the hardest time deciding whether to make a purchase now at all, much less decide on what to get. 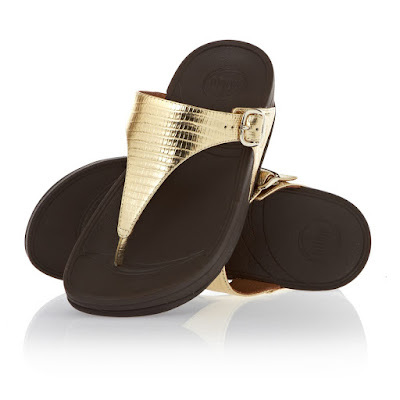 It probably makes the most sense to get another pair of Fitflops, either the Skinny or the Skinny Crisscross Slide. I could maybe also consider a pair of Birkenstocks (probably the Arizona or the Gizeh), which is what I had been thinking of before picking the Fitflops instead, though I remember that I thought they looked a bit clunky on my feet. I imagine the Birkenstocks would be hardier than Fitflops, though. 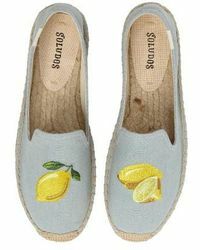 Perhaps unwisely, given that I should only really be in the market for a pair of comfortable sandals to replace the Fitflops, I had also thought about getting a pair of cute, embroidered Soludos espadrilles (maybe with lemons, or oranges!). That's an impulse that I really should not indulge in, however, as espadrilles seem to not be the most durable of shoes (likely to last only one season?) and that they could easily be damaged if they got wet, so they're not suitable for NYC's unpredictable, sometimes thunderstorm-prone summer weather. Also, I assume that I wouldn't want to be wearing socks with them in summer, which means they'd get gross and sweaty, and probably smelly, way too easily. What are your go-to summer shoes? 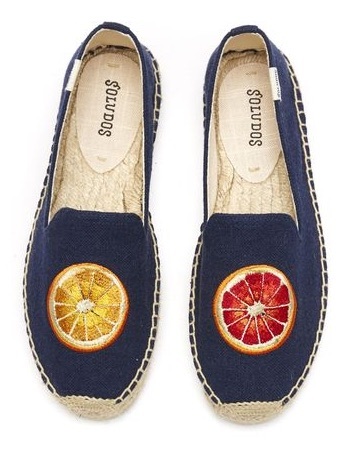 Are espadrilles actually more practical than they seem on paper?